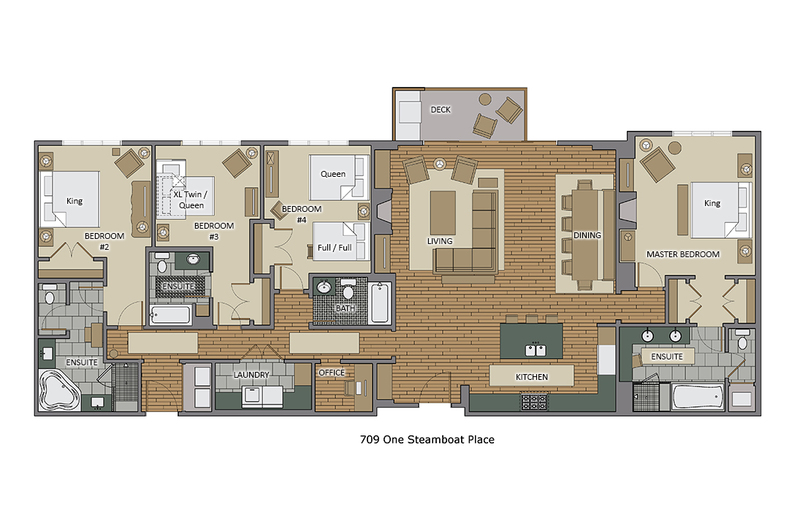 The Lone Star Mountain Residence at One Steamboat Place offers luxurious accommodations for up to 11 guests just steps from the Steamboat Gondola. This spectacular OSP private residence features a large living area with views overlooking the Plaza of the Steamboat Mountain village. The open floor plan connects the living and dining areas to the kitchen abundant space for the entire group to be together. The iconic OSP kitchen design is complimented by professional equipped kitchen with everything you need including Viking appliances. You can grill outside on the built-in Viking gas grill on the deck. All One Steamboat Place residences feature rich colors, natural textures, and sumptuous fabrics throughout the home. Each master bedroom offers a gas fireplace. The main master bath features a steam shower and Jacuzzi tub. In this residence 2 bedrooms offer a King bed with private bath. The third bedroom offers a bunk bed with a Twin bed over a Queen. The fourth offers a Queen bed and a bunk bed with a Full bed over a Full bed, all with a private bathroom. Great spot! Super convenient! Perfect vacation! Great location and the condo has everything you need!! Moving mountains was awesome in terms of setting up ski rentals as well as other excursions. Condo was very comfortable with the master on the other side of the living area from the other 3 bedrooms. Would rent again in a second!! The staff at Steamboat One are exceptional. The apartment is fantastic we feel like it is our home away from home after booking the same apartment three years running and have booked for 2019 again.